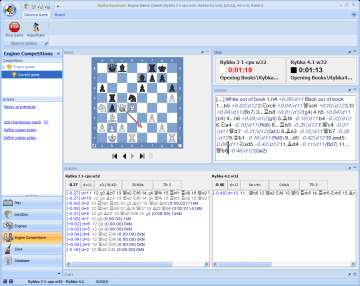 ● Chess players who are considering switching to Aquarium from their current analysis software and want to compare their infinite analysis capabilities. ● Current Aquarium users who need guidance regarding the next steps towards the more powerful infinite analysis features. After being preempted by the release of Aquarium 2011 for the past two months, we now continue our coverage of engine matches and tournaments in Aquarium. We’ll have a closer look at this window now, starting in the upper-left corner. There are two tabs at the top of the image. Observe Game is currently active, but Board allows you to set various options related to board display and move input. There are two buttons on the Observe Game tab.